​Willoughby Thomas Eaketts was born on 27 November 1888 in Gloucester, the oldest son of Thomas and Emily Eaketts. At the registration of his birth his Christian names were recorded in reverse order but his baptism and census returns indicate that this may have been a mistake. Indeed, Willoughby was such an unusual name that it was occasionally interchanged with William on his military records. The family, which included his next brother, James, moved to Upton St Leonards during his childhood, and to Frampton in 1910. It is not clear when Willoughby enlisted with the 2nd Battalion of the Gloucestershire Regiment, but the 1911 census records him as a lance corporal at Verdala Barracks, Malta. However, at the time of his marriage to Beatrice Alice Smith on 27 December 1913 at All Saints, Gloucester, he was living at 12 Bishopstone Road in the city, and working as a lawyer's assistant. Their son, Willoughby James, was born during the summer of the following year. 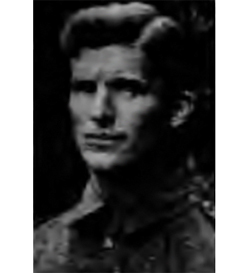 At the onset of war Willoughby must have been called up immediately for he arrived in France on 13 August 1914 with the 1st Battalion of the Gloucestershire Regiment, just in time for the battles of Mons, Le Cateau and the Aisne. His active service was fairly brief for he was taken prisoner at Ypres on 29 October. The Red Cross and German records show that he was unwounded at capture and was then held successively in Munster (December 1914), Minden (March 1917) and Soltau (from December 1917), the largest prisoners of war camp in Germany. The Germans later transferred many of their prisoners to neutral Holland to be interned, including Willoughby who arrived there on 15 March 1918. Repatriation came after the Armistice when he arrived at Hull on 22 November 1918 on the SS Porto. He was awarded the 1914 Star, British War Medal and Victory Medal, but his service was not commemorated on the plaque in Frampton Village Hall. Willoughby's prisoner of war records give his wife living at 39 Blenheim Road, Gloucester (March 1917) and Lacon Cottage, Woodchester (December 1917), although he was on the Frampton electoral register in 1918 as an absent voter so she may have come to live in the village at that time, perhaps at the Eaketts' family home at or near Nastfield Cottage, The Green. The death of Willoughby Thomas Eaketts was registered in the Gloucester district during the spring of 1976, and for completeness, his Christian names were also listed in reverse.